Everyone shops. It’s part of our weekly routine. But did you know it is also one of the easiest ways you can support Portland Rescue Mission? Thanks to our shopping partners, you can get great deals and also help restore the lives of hurting people in need. Your support provides more than 330,000 meals a year to our homeless guests at the Burnside Shelter. Did you know that you can use your Fred Meyer Rewards Card to support Portland Rescue Mission? Choose the Mission as the nonprofit you want to support in the Fred Meyer Community Rewards program. Then, every time you shop at Fred Meyer, they’ll make a donation to Portland Rescue Mission. You get to keep ALL the benefits of your Reward Points. Support Portland Rescue Mission when you shop at Amazon! First, choose Portland Rescue Mission as your charity of choice. Then instead of using www.Amazon.com, shop at Smile.Amazon.com. (Add a bookmark to your browser so you’ll remember to shop Smile.Amazon.com every time!). Amazon will donate 0.5 percent of all your eligible purchases to our organization. The AmazonSmile website is structured the exact same way as Amazon.com, and all your Amazon Prime benefits along with the other features you love about Amazon.com remain intact. Sign up and see more details at Smile.Amazon.com/About. Another convenient way to help Portland Rescue Mission is to donate right at the register when you buy groceries. 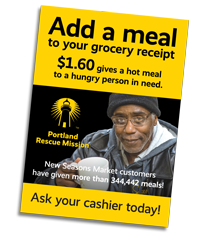 Shop a participating New Seasons Market store and let your cashier know that you’d like to “Add A Meal.” $1.60 (or any amount you want) will be added right to your grocery bill to support Portland Rescue Mission. See participating locations in our Add A Meal program. To save big on local deals, follow the link to Fox12 Daily Deals from here and a portion of your purchases will come back to Portland Rescue Mission.